College: Where Are We Now? The National Association of College Admissions Counseling (NACAC) released their annual report this week that evaluates statistics and movement over the last 10 years with regards to college admissions. There are a few trends that are important for school counselors to note. For students who applied Early Decision in the fall of 2011, there was an acceptance rate of 59%, versus 53% for the total applicant pool, giving Early Decision applicants a 6% advantage. For students who applied Early Action in the fall of 2011, there was an acceptance rate of 65%, versus 63% from the total pool, giving only a 2% advantage. Early Action allows students to get a decision early, usually in December, but they are allowed to apply to multiple schools without committing to one until May 1st. Thus, it seems like the advantage that may have once been perceived to exist for students who chose to apply either Early Decision or Early Action may be eroding. The percentage of students applying to 3 or more schools is up from 67% in 2010 to 79% in 2011. The percentage of students applying to 7 or more schools is up from 25% in 2010 to 29% in 2011. The top factors that go in to college admissions decisions remain grades in college prep classes, rigor of a student's curriculum, and standardized test scores. The importance of class rank, however, has declined over the last 10 years. This is the second in a series of reflections on the RAMP process. A few weeks ago I was teaching a class of new counselors and one of the topics was "data." What are the different types of data that school counselors use? Why do school counselors need to use data in their practice? Where do you start? I've learned over the years that school counselors, new or otherwise, are all at very different places with this topic. Our comfort level with finding, using, and analyzing data seems to be dependent on a wide variety of factors, such as when you were in graduate school, the specific graduate program that you were in, the comfort level of your professors with data-driven practice, and the professional development that you received after graduation supporting the use of data in your counseling program. Yet, if you are at all interested in working towards RAMP (Recognized ASCA Model Program) certification, it is a world with which you will need to become familiar. Quickly. As I wrote about in a prior post, at my school we have really been working towards RAMP for several years. A large part of that process has been spent in developing a comfort level, as a team, with data. What I am finding, though, with the RAMP process, is that we are really being forced to go deeper into our data, both to justify our interventions and define our goals (a topic for a later post), as well as to analyze the effectiveness of our programming. This process is really helping us to tie together our mission, vision, and beliefs with what we do and how we do it, as well as making us ask the question as to what impact all of our programs are having on academic achievement, post-secondary outcomes, attendance, and school safety. Where, though, do you begin? Process Data: Process data literally tells us two things--who is effected by the intervention and what did they do? Thus, 97% of 9th graders wrote a post-secondary goal. 320 seniors took part in a lesson about dating violence. 56 parents participated in an evening program that focused on supporting students' study-skills at home. This type of data is a place to start--it is helpful in that it can help to show people that you are taking an active role in the school community and are working with students and parents, oftentimes in large groups. If you are in a situation where you have concerns that your community is unsure of what it is that you do or have the impression that you don't do much, this type of data can help to inform them of your role. However, it is lacking in that it does not demonstrate the change or impact that your interventions may have. Perception Data: Perception data comes in a variety of shapes and sizes. Basically, you are getting a snapshot of people's thoughts, or "perceptions," on a program at a given time. One way that you might use perception data before a program is to do a needs assessment to see what the perception of your students, parents, teachers, administration, or any combination thereof might be with regards to what they need from you. For example, if you are trying to determine what groups might be the best use of your time in your elementary school, you can develop a brief questionnaire that asks students to pick their top two out of several options, and maybe follow up with a questionnaire to the teachers and parents, as well. In this way, you are making decisions about how to utilize your time and resources that reflect what your school community needs, not just what you think they need or what you like to do. Thus, you may learn that 70% of your students want groups on study-skills and that this is supported with 80% of teachers and parents, versus only 2% of students, teachers, and parents that feel a group on social-skills would be beneficial. Now, this does not necessarily mean that you will throw a social-skills group out the window, but it would warrant looking into it further and finding additional sources of data that might support the need. We also use perception data quite often to see what change has occurred in students feelings, thoughts, or knowledge as a result of our interventions. Often this is done through either a pre and post test combination, or simply a post test. These can come in many forms, but asked in developmentally appropriate ways (a choice of two pictures, such as a smiley face and a frowny face for younger students versus a five-point Likert scales for older students) how someone believes they have changed because of your lesson, group, or program. Thus, there was a 50% increase in 10th graders knowledge of career options as a result of your lesson. After your lesson on bullying and harassment, 98% of 8th graders could correctly identify the bully, the victim, and the bystander and their roles in the bullying cycle. Thus, perception data is more powerful than process data in that it can demonstrate change and growth as a result of your program. However, it is subject to self-reporting, which is not always the most reliable, and does not address the direct impact that the program has on the academic process. Outcome Data: This data was previously known as "results" data, so if you see that term used in prior publications, articles, or entries, realize that they are referring to the same general idea. Outcome data refers to academic information such as grades and test scores, but also enrollment in rigorous courses and post-secondary planning outcomes. It also refers to attendance and school-safety. This is the most powerful data that we can use, as these are the hard numbers that administrators, communities, and state and national entities are tracking. If you can show that through your intervention grades have improved, test-scores have gone up, enrollment in advanced coursework has increased, more students are applying and being admitted to two and four year colleges, students are coming to school more, or disciplinary incidents have decreased, you are demonstrating that your program is having a direct effect on the academic process, success, and "outcome" of the students in your community. 80% of students who participated in the year-long "Student Success" program saw an increase of .5 or better in their GPA. Students with five or more unexcused absences that participated in the student-parent program targeting school engagement saw a 65% drop in truancy after two months. As a result of a school-wide, comprehensive bullying and harassment campaign led by the school-counselors, reported incidents of bullying and harassment were down by 50% from the previous year. Ultimately, we want as many of our programs to show a change in this data category, as it speak to the true power that school counselors can have on the success of our students. For more in depth explanation of this information, refer to the ASCA National Model, 3rd Edition. So, why do school counselors need to speak this language and use data? I have been involved in many conversations over the years with practitioners who state that finding data, developing instruments to measure interventions, and analyzing and presenting data takes time away from our direct work with students, which is what we have been trained to do and which is what is most beneficial to students and communities. There are those that feel that the data-driven movement has taken the humanity out of our profession. My counter to this is that first, we need data to better make use of our limited time. We all have high case-loads, and some of us in various parts of the country have extremely high case-loads. By looking at information such as grades and test-scores, broken down by subgroups, as well as needs assessments, we can better target our time with those who may benefit the most from more direct interventions. Secondly, we need to invest our time and resources on programs that have an impact. This scenario happens all the time: You have a speaker come in. You think the speaker is wonderful. Other adults think the speaker is wonderful. No one ever asks the kids what they learned from the speaker, and no one ever follows up to look at academic, attendance, or school-safety data to see if there was any strong, long term impact from the speaker. Are you really getting the bang for your buck with this intervention, especially if you have taken away from instructional time and spent money to bring this speaker in? By using data to measure the effectiveness of programs, either with perception data, outcome data, or both, you will quickly determine which programs work and which do not. This empowers you to justify cutting some things, changing some programs, and developing others based on the true needs of your school. It also will allow you to ultimately spend more time with students if you are able to do away with some things that have no impact whatsoever on your school community. Lastly, we need to collect and use data in order to promote, defend, and expand our profession. As the latest 2012 National Survey of School Counselors from the National Office of School Counselor Advocacy (NOSCA) tells us, both school counselors and school principals believe that school counselors are ready to take the lead in helping develop students who are college and career ready and chart them on a path to strong post-secondary options. However, for better or for worse, we need to show our local, state, and national communities just how strong an impact that we are able to have on the academic achievement and outcomes of our students in order to receive the necessary resources and reasonable case-loads that will allow us to do this important work. Examine data sources that are already available. Most schools across the country have public "report cards" that breakdown testing data by subgroups. This can give you an idea pretty quickly of where students are and are not doing well, academically. You can take this information to your team, administration, or advisory council to begin to develop a program that can address this. Additionally, look at student grades, graduation rates, attendance, and school-safety data. This information alone should help to give you some ideas of where there are needs for your services within your building. Consider doing a needs assessment. Take a deep breath--this does not mean do a needs assessment of every student, teacher, or parent in your building. Target a small population--pick a grade level, do a random sampling, or look at a subgroup that you've found based on information you've gleaned from the previous bullet-point. In this way, before you develop a program, you can get a better handle on what those students need most. You may think that your group targeting 7th grade attendance needs help with study-skills, but your needs assessment of them prior to starting may point you in a different direction. Find ways to collect data on your programs. If this is overwhelming, start with one or two, and over the course of a few years add more until you are examining your entire program. It is important to begin to ask yourself and your team what changes in perception and student outcomes are occurring as a result of your interventions. You can use paper-pencil pre and post tests or you can use online tools like Survey Monkey and Naviance to gather perception data, and you can go into your school's database to gather the outcome data. Once you start taking a look at some of the programs that may have been in place for years, you may be surprised by the results. This can begin some important conversations within your school as to how to best utilize your time and resources. Some of them may be difficult conversations, but with data you are always able to bring the discussion back to student success and outcomes. Share your data. Regardless of what the data shows, whether effective or ineffective, share your data with stakeholders. This can be a great thing to do during your advisory council meetings, but you should also feel free to share it with teachers, administrators, and parents as appropriate. This can be done informally through e-mails, presentations, or newsletters, or you can develop more formalized reports. 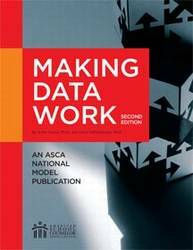 If these steps seem like they are just scratching the surface and you are looking for more information on how to compile data and make more formalized DATA reports, I would highly recommend taking a look at Making DATA Work by Dr. Anita Young and Dr. Carol Kaffenberger and available through the ASCA Bookstore. This book will go into much more detail and give you step-by-step instructions on compiling data, developing instruments to measure programs, and writing a DATA report to share with your stakeholders. It also includes samples for you to look at that can serve as models. Once you begin this process and develop a comfort level with data, you will not only be on your way to RAMP, but you will have begun to find ways to maximize your time with students as well as demonstrate just how powerful the role of a school counselor can be within a school and community. I am still not used to the fact that it is getting dark outside around 4 o'clock in the afternoon. There are times when I wonder about having gone into a career where I go to work in the dark, spend almost the entire day in my windowless yet tastefully decorated office, and then leave work just as the sun is beginning to set. My already pale skin moves from its typical cream with a hint of pink to full-on pasty white. I could easily be considered for a role as an extra in any one of the plethora of television shows and movies featuring vampires. Sigh. Welcome to the dog days of winter. It has begun--the winter season. Not only is there less daylight, but it is colder, making people less likely to partake of natural sunlight outdoors even if they could. The holidays are coming, which means hectic travel schedules and more time with family. This much togetherness can be positive but also has the potential to aggravate and enhance any already existing conflict or discord. For those families who are already struggling financially, emotionally, or both, this time of year can be a true challenge. If you've been in school counseling for a while, you know that these stressors are not confined simply to adults, but that they also can have quite a large impact on our students. A recent article by Lynne Shallcross in Counseling Today discussed the topic of depression, and a large section of it highlighted the often invisible high-risk group of adolescents, especially adolescent girls. According to the National Institute of Mental Health, about 11 percent of adolescents have a depressive disorder by the time they are 18 years old, and according to the World Health Organization, depression is the leading cause of disability amongst people ages 15-44. Additionally, depression can lead to suicide, which is still the third leading cause of death amongst youth ages 10-24 years old. You may think that this is something that you will not really address as a school-counselor. After all, we do not provide therapy, and surely if a student is depressed, then they will be taken care of by an outside clinician. While this may be true, it does not mean that we do not still play a key role in assisting students and families who are working through depression. More importantly, we are in a position to be able to work towards prevention and education. Depressed mood most of the day, almost every day. The symptoms also need to cause significant distress in their social and/or academic functioning (APA, 2000). It is important to note that these are the symptoms for adults. There are some variations among children and adolescents. First, as is discussed in the Counseling Today article, depression can often be a challenge to diagnose in adolescents because they are already typically undergoing a lot of mood shifts. We often chalk up extreme sadness in teens to simply been a teenager. However, if a student's sadness about a situation continues to linger over time about an event that occurred, this may be a warning sign. Additionally, you may begin to see other areas of concern. For example, we should also look for changes in attendance, grades, peer groups, and peer relationships, in addition to the mood alterations as well as any physical symptoms like a change in sleeping and eating habits. Further, in children you may not see so much the diminished interest or depressed mood, but rather instead irritability and defiance. Also, because of adolescents' quick-to-change moods, strong desire to fit-in, and a need to show a certain "face" in public, students may be depressed and yet also be observed in some situations to appear as if nothing is wrong. It is not uncommon to have a student who will seem to be outgoing as ever in school, but when they are home by themselves report that they do nothing but cry, sleep excessively, and hide from family and friends. Thus, often it can take some probing conversations and a careful examination of all the possible symptoms to really get at the heart of the matter. It is important to note that, as previously stated, girls are at a higher risk of depression than boys, as are children who have suffered trauma or who have conduct or attention disorders. Additionally, LGBTQIA children are also at a higher-risk for suicide and mental health concerns. Build resiliency in all students. While there is certainly a physical/chemical component to depression, there is often an event of some kind that will trigger an episode. Students with few coping schools and resources are more likely, in this instance, to slip into depression. As a high-school counselor, we often talk to our new students and our 9th graders about participating in sports, clubs, community service, and additional extra-curriculars and stress the impact this can have when they fill out college applications. However, participation in these activities also helps to build connectivity to the school as well as assisting them in forming positive relationships not only with other students but also with the coaches and sponsors. It is these links to other people, both peers and adults, and the trust between them, that can be invaluable when a stressful life event occurs. Rather than feeling like he/she is alone, a student will have a network of trusted friends and mentors to go to. School counselors can help to connect students with these activities through group orientations, through their counseling website/Twitter feed/Facebook page, or through individual meetings with students. Further, if the activities are related to physical activity, such as club or school sports or dance, these can add another positive coping mechanism and mood-enhancer to the student's life. Additionally, school-counselors can educate their students on the role of the school counselor as someone who can help them problem solve social/emotional issues in addition to academic and career/college concerns. If students have a relationship with the school counselor that is based on trust, they will be more likely to come to you if they are struggling with an issue. The goal is to build a network of support around all students before an episode of depression begins. Educate the school community about the signs of depression and suicide. We do many lessons with our students, most of them focused on academic and career/college skills. How about throwing in one or two on the warning signs of depression and suicide? If the students know about the signs--changes in behavior with regards to attendance, grades, extra-curriculars, friends, sleep, diet, talking about harming themselves, saying goodbye to others, and giving away possessions, etc--then they will be more able to clue adults in when they become worried about their friends. Additionally, let students know what to do if they are worried about their classmates. They should talk to a parent, teacher, counselor, or other trusted adult about their concerns. Honor the confidentiality of the student that reports unless there are some extreme circumstances which would make disclosure a necessity. In this way, students will feel more comfortable with letting staff know if they have a friend about whom they are worried. Additionally, train the staff on warning signs and develop a procedure for reporting any students of concern to the school-counselors. This is where strong relationships with your teachers and staff can come into play. I am always very thankful when a teacher contacts me to ask me about a student who has been missing their class, suddenly not turning in work and failing tests, or who exhibits some other extreme behavior change. This information allows me to check in with the student to determine what the situation may be and to develop a plan of action to address the presenting issue. Do a suicide assessment and monitor the student. It is important that if you have a student who presents with some of the signs of depression and/or suicide, that you assess them for risk. If you are at all concerned or are not comfortable with this, please get additional support from another counselor, school psychologist, or school social-worker. If there is cause to believe that the student may be suicidal, it is important to immediately contact the parent and ask them to take the student to be evaluated by a mental health professional. Do not leave the student alone for any reason until the parents arrive. When the student returns to school, make sure to follow-up with the student and family and check on the student frequently. If the student presents with some of the signs of depression, contact the family and refer to their physician or recommend mental health providers. If you have a student whose grades have dropped, who is sleeping 12 hours a day, who has stopped engaging with friends and with activities they used to love, you have cause to be concerned about this student, and you think they might be clinically depressed. How do you address this with the parents? Remember: school counselors do not diagnose. You should not say that their child is suffering from depression. However, we can tell the parents what behaviors and changes we and other school community members are observing, state that we are very concerned by these observations, and recommend that they please follow up with a visit to a primary care physician or a mental health professional. They should start with their insurance company, but you should also have on hand a list of local providers, some that will provide services on a sliding scale. Educate and work with the parents. All parents have dreams for their children, and when a student becomes depressed, it can really interrupt and impact both their academic and social lives. This can be a challenge sometimes for parents who are worried that this is going to ruin their child's chances to get into a certain college or achieve certain goals. We have come a long way in this country with regards to acknowledging the legitimacy of mental illness, but there is still a long way to go until we see it in the same framework as physical illness. People will often wonder why someone cannot simply "snap out of it" when it comes to depression, and it can be our role as school counselors to help educate parents and the community that it is indeed an illness, that it takes time to heal and recover, and that the primary focus for a child who is depressed should be on getting well. The grades and college plans will come when the child is feeling stronger. Additionally, some parents may simply need more information about depression in adolescents, and if they have a relationship with you as their child's school counselor, they may be more comfortable seeking answers to their questions from you versus outside providers. Help accommodate the student's academic and school needs. Students who are in the throws of depression and recovery may not be able to keep up with a full-course load, or may need to lessen the rigor of their classes. They may need reduced work-loads or access to teacher notes. Additionally, they may need more access to you, the school psychologist, or the school social worker than other students. You can help to coordinate with the student, the parents, the teachers, and the outside clinicians to develop a plan that will best assist that student. As they year goes on, we will see more cases of depression in our students. As school-counselors, we can take the steps necessary to do some preventative work and education, as well as put supports in place ahead of time to help assist our students and their families who are working through this issue. APA. (2000). Diagnostic and Statistical Manual of Mental Disorders, 4th Ed., Text Revision. Arlington, VA: American Psychiatric Association. pg. 356, 375. Mancillas, A. (2009) Supporting Students With Depression. Retrieved from www.ascaschoolcounselor.org. This week From the Counselor's Office was recognized as one of the top 100 resources for counselors on the web by the website, Masters in Counseling. I am honored to have been included with so many other excellent, informative, and inspiring school-counselor blogs!